The following article by Rabbi Raymond Apple originally appeared on The Times of Israel blogs on 4 February, 2019. A third of the Israel Defence Force are women but apart from religious controversies about women in the military, the IDF leadership says that not all combat roles are suitable for women such as carrying a wounded comrade on a stretcher on one’s back for many kilometres. It is males which the Torah (Deut. 20) considers when it speaks of whether a newly married man can be conscripted for the army. Women were not thought of as soldiers. The Talmud says bluntly, “It is the way of a man to make war, not the way of a woman” (Kiddushin 2b). The men went to war; the women stayed home, often becoming young widows. Deborah (Judges 4) helped to destroy the enemy, like Yael (Judges 4-5) and Judith (in the Apocrypha). These women operated with wits, wiles and tenacity. The Mishnah says that in an obligatory war (e.g. to defend the Land of Israel) all must go and fight, even a bride from her chuppah (Sotah 8:7), though Judaism prefers women to have a more private role, saying, “The whole glory of the princess is inward” (Psalm 45:14). Nonetheless women did go into battle. Some of Bar Kochba’s troops were female. We have the names of those who held leadership rank in the struggle against Rome. 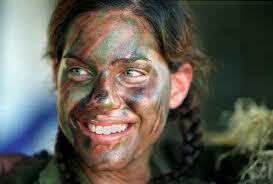 The Sefer HaChinnuch says that the command to eradicate Amalek “applies to males but not to females” (Mitzvah 603). The Avnei Nezer (Orach Chayyim 509) distinguishes between a battle, in which only males take part, and attacking an individual Amalekite, which a woman can do. Sefer HaChinnuch itself (Mitzvah 245) allows women to help eradicate the seven Canaanite nations as part of the mitzvah of settling the land. Because of the prohibition of cross-dressing (Deut. 22:5), Rabbi Eli’ezer ben Ya’akov says that a woman should not wear military uniform or carry weapons of war (Nazir 59a; Sifra to Deut. 22:6; Targum Onkelos to Deut. 22:5). Women were deemed too weak to carry arms, and it was feared that their modesty and dignity would be compromised in the uniformed military. In the “Journal of Halacha and Contemporary Society“, No. 16 (1988), Rabbi Alfred S Cohen quotes the Chazon Ish (Avraham Yeshayahu Karelitz), who told David Ben Gurion that Judaism would be morally endangered if there were women soldiers. On Deut. 23:1, Ramban warns that soldiers “rob, destroy, eat forbidden foods, commit adultery, and indulge in ‘every disgusting thing’”. Women would face risks and might be raped. The rabbis prefer women to stay behind the scenes and handle the supplies. Rav Soloveitchik says that they can be used to sabotage enemy installations. Rabbis Moshe Feinstein and Ovadia Yosef allow women to bear arms on guard duty to save life (pikku’ach nefesh). In 1995, the Israeli Supreme Court heard the case of Alice Miller v. Minister of Defence, Chief of Staff and Others. A woman wishing to be an air force pilot claimed that excluding her from the training course was sexual discrimination. The IDF argued that because women serve less time in the military and can become pregnant, neither they nor the nation would derive the full benefit from the expense of training a woman pilot. The court upheld the woman’s petition. Justice Dalia Dorner quoted Tennyson, “Man for the field and woman for the hearth; man for the sword and for the needle she” (“The Princess”, Second Song). The judge agreed however that women “should not be prevented from achieving their potential and aspirations simply because of their normal functions”. In the Diaspora there are few Jews in the military. I am not aware of demands for women chaplains, even in non-Orthodox groups which routinely ordain women. What would be the rabbinic response to a request for a woman chaplain? If the problem arose whilst I was senior rabbi to the Australian Defence Force, I would have sought halachic guidance and spoken to Christian women chaplains to ascertain whether womanness impinged upon their work. There are two issues: the chaplain as pastor, and the chaplain as agent of religious tradition. Pastoral work requiring personal skills does not in itself preclude women chaplains. Counsellors, mentors and moral guides are vital in a context that demands morale and stability. Women can clearly fulfil this role. A woman scholar or teacher is no major problem. Some orthodox groups accept female halachic pleaders. What about women officiants? Speaking at weddings and funerals is not such an issue as being cantors (chanting services, not just reading psalms or delivering homilies). It is unlikely that women chaplains would be sent to forward posts. This entry is filed under Articles, Israel, War & Peace, Women's Issues.